Once again things have gone all topsy turvy in the world. Well in Vancouver specifically. In order to promote their new 'Sprize: shopping turned on its head' offering (whereby they'll refund you money back if you've bought an item and you pop back into the shop to find the price reduced) Gap came up with this very fun and eye catching launch campaign. 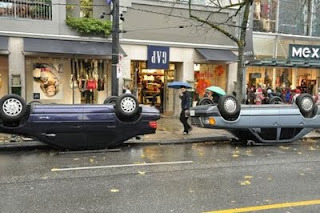 In an overnight guerrilla marketing action stores and various items in front of them such as cars, post boxes, erm ... people etc were turned upside down. Sometimes literally translating these slogans really is best.